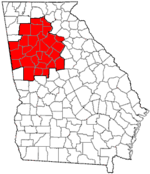 Paulding County is a county located in the northwestern part of the U.S. state of Georgia. The estimated 2017 population is 159,445. It is a suburban Atlanta county and a part of "Metro" Atlanta. The county seat is Dallas. Paulding County is included in the Atlanta-Sandy Springs-Roswell, GA Metropolitan Statistical Area. It is in Georgia's 14th congressional district. The southeastern portion of Paulding County, from just north of Hiram to north of Villa Rica, is located in the Middle Chattahoochee River-Lake Harding sub-basin of the ACF River Basin (Apalachicola-Chattahoochee-Flint River Basin). The very western portion of the county, centered on State Route 101, is located in the Upper Tallapoosa River sub-basin of the ACT River Basin (Coosa-Tallapoosa River Basin), with the majority of the central and northern portions of Paulding County located in the Etowah River sub-basin of the same ACT River Basin. ^ a b "Paulding County, GA". United States Census Bureau. Retrieved April 14, 2018. ^ "The Dallas New Era". www.thedallasnewera.com. Retrieved 2018-08-10. ^ "Silver Comet Trail, Paulding County Information - Georgia". www.silvercometga.com. Retrieved 2018-08-10.